One of our good customers, Scott Phaneuf of Hatfield, MA recently purchased a NOS (New Old Stock) GM tool bag with all the correct tools. It was found in a San Diego dealership back storeroom. Somehow it had not been thrown away over these many years. In earlier years canvas tool bags were with the vehicle when new at no extra charge. Later they became an extra cost option and this design is our feature item. As the quality of clear vinyl improved, they could now use this material as part of the tool bags. Photos show the pouch, the enclosed tools, and the original cardboard box that kept the total package. The part number 987322 was for customers that had bought most all General Motors cars and trucks between 1957 through 1962. 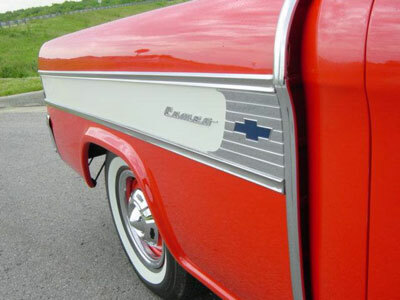 With the introduction of the new small block V-8’s in 1955 Chevrolet trucks, modified sheet metal was created to help in cooling. 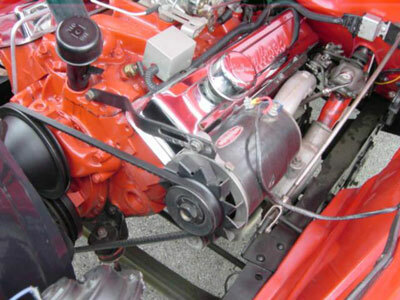 The new truck design came standard with the proven 235 inline six cylinder but when an optional V-8 was added, cooling modifications were necessary. 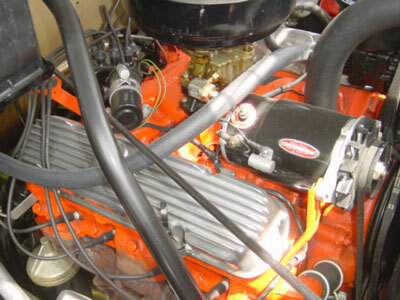 The short length V-8’s cooling fan was too far from the radiator and could pull air from above and below the engine and less through the core. To prevent this, all V-8 trucks came with an upper and lower metal baffle plate to help better pull air through the radiator. These metal plates have become very difficult to locate in recent years. The lack of these two plates on (restored?) 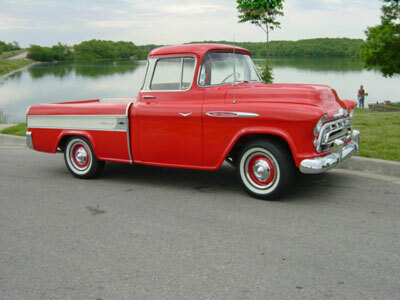 V-8 trucks are usually a strong indication the vehicle has been converted from an original six cylinder. The mechanic was either not aware these plates existed or had no idea of where to locate them. During 1958-1959 the shroud was redesigned. It became a more traditional metal circle as is found on more modern vehicles. This allowed even more air to be pulled through the radiator core. 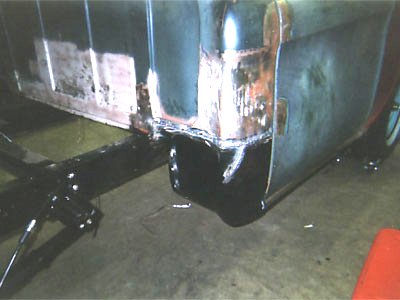 The following photos show original Chevrolet radiator cooling sheet metal from 1955-1957 V-8 trucks. The dark lines on the drawing relates to how these plates fit in the original vehicle. 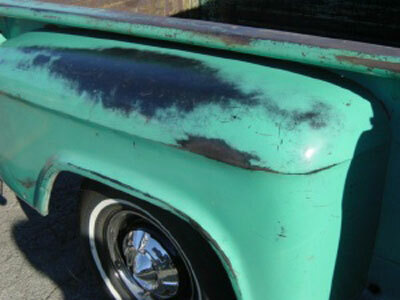 Have you ever crawled under a pickup for sale looking for damage? You then turned it down because some rust was coming through the floor. Well, check this! 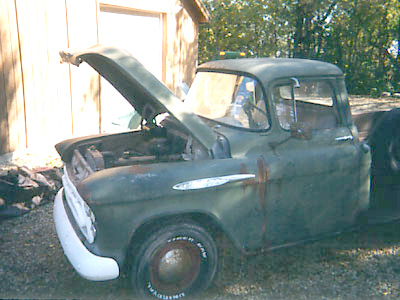 David Cross of Stillwater, Minnesota found this 1957 Chevrolet 1/2 ton and ignored the signs of major rust. What is now a show quality truck would normally have been crushed by a recycler. This 1957’s life began with the highway department of the state of Iowa. When it was retired many years later it was sold to a local farmer who used it only on his property and never titled it. Thus, David can honestly say he is the second owner of record. When the farmer used up what life was left in the pickup, it wound up in a ravine with occasional flooding and an infestation of mice, snakes and other varmints. A used car dealer pulled it out of the mud in 2000. His later ad said “The truck is all there and runs”. David, a new person to the truck hobby, drove it home five miles with no brakes, a leaking gas tank, and water running from the radiator. It’s little 235 engine was struggling. We wonder why! It is now restoration time. David refused to yield to its many problems. Admitting to a mistake was out of the question. David and this body and paint person took the truck apart. They found it much worse than they ever imagined. The small rust holes grew gigantic when even taped with a little hammer. 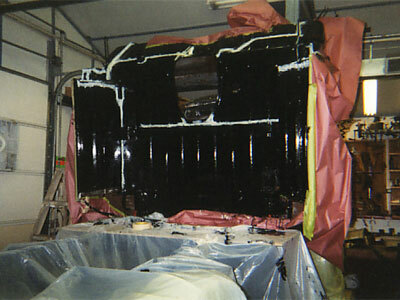 David’s body and paint person is Kevin O’Brian from O’Brian’s Paint and Body Works in Afton, Minnesota. He did all the metal work and paint. David provided most of the mechanicals and assembly. Kevin is one of the best body persons in the state but he admitted this project stretched him into new territory. 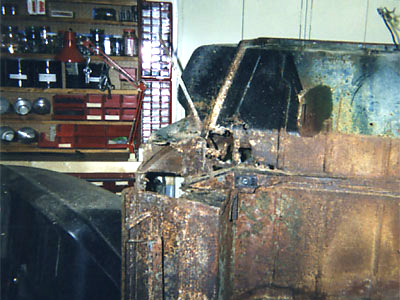 David and Kevin saved the frame, running gear, cab, and hood. 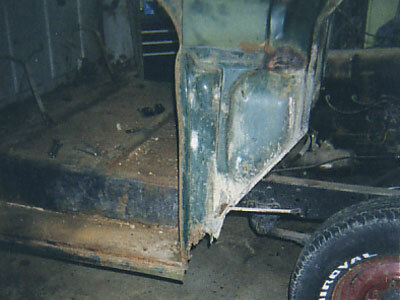 The rest of the 1957 just was not repairable! Saving the body was major since the front body mounts were gone. Kevin built a jig to align the cab with the frame. This was necessary while the floor and cab mounts were constructed. The strip across the windshield top was rusted out. New metal had to be shaped and welded in, a major task. To fit the new windshield, the cab had to be just right. No errors allowed. 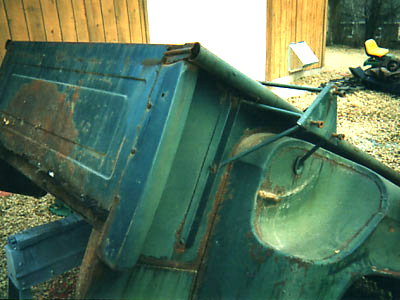 The metal body steps would not hold a person without bending. 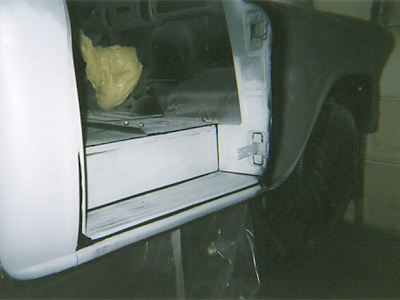 This total area was taken out from the remainder of the cab. The following pictures will show the finished product plus what David and Kevin had to work with. 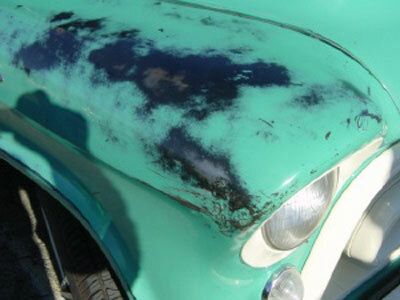 The restoration of this derelict 1957 pickup is clear evidence that given time, money, talent, and loving care anything is possible. You can contact David at davidlcross@yahoo.com. What we started with. Looks much better than it really is. 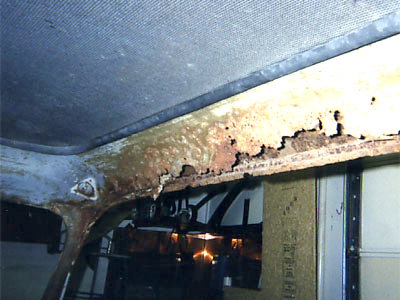 Really ugly rust thru inner and outer cab top, big concern about windshield opening. Cab bottom. ugh! lower hinges not attached to anything solid. door pockets gone, floor boards rusted through. Front cab mount badly deteriorated. Cab corners, inner and outer rusted through. 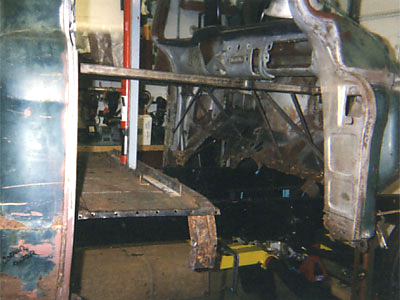 Alignment frame to position what’s left of cab on frame. Now the welding can begin. 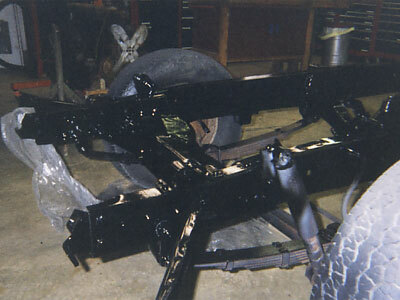 Sandblasted and repainted frame before spring and axle assemblies were removed and rebuilt. 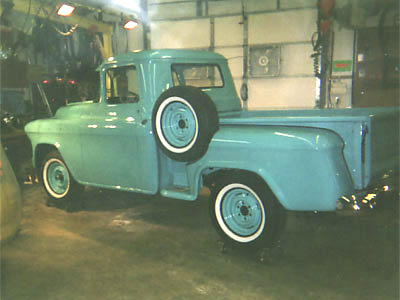 During the early years of GM truck production, many examples exist which relate to their vehicles being designed more for work. Changing a trim part for appearance reasons was usually secondary if it resulted in unnecessary expense. 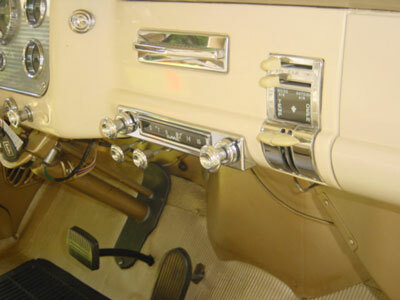 Often parts were used that had already been on GM automobiles. This eliminated expensive new tooling costs and kept GM truck prices in line with the competition. An excellent example of this type thinking is shown with the 1957-1960 hubcaps. 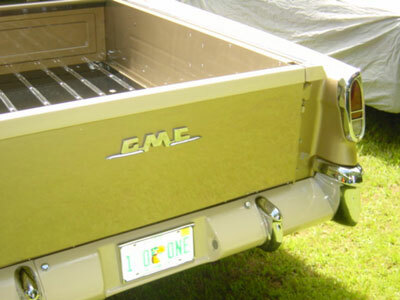 Even though the 1960 pickup was a totally redesigned vehicle, GM carried their older hub cap on this new pickup. The reasoning goes back to keeping truck prices low. 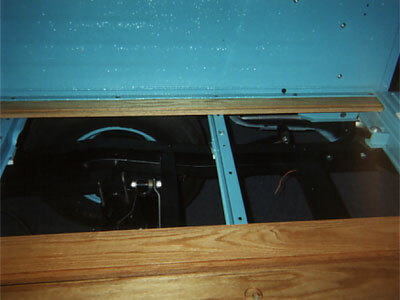 The 1960 1/2 ton wheel was to be the last carrying the inside spring clips to secure the hub caps. 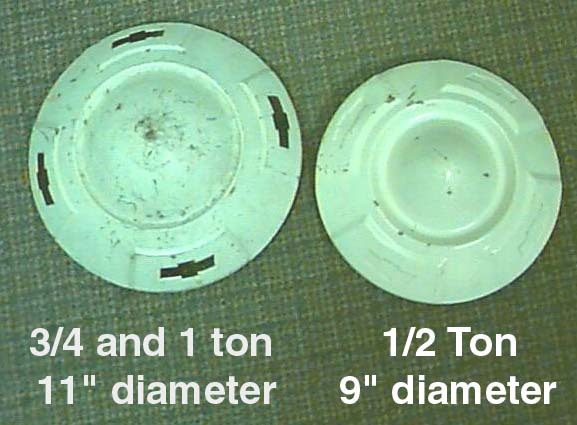 As truck hub caps were used several years, it was not likely a new 1960 design would be created for only one year. GM held off from using a redesigned hub cap until 1961 so that it would fit on the new non-clip wheel. To stay with tradition, this new 1/2 ton cap was then used three years. To keep the 1960 3/4 and 1 ton hub cap appearances similar to the 1/2 ton, GM again retained the earlier style. 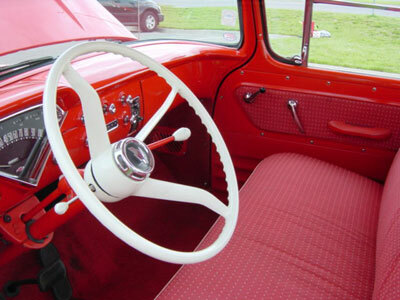 This occurred even though the larger truck inside clip split rim wheel design was basically unchanged between 1946 and the late 1960’s. 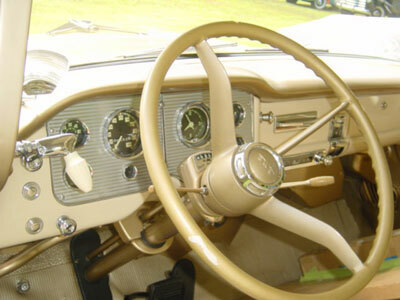 Chevrolet and GMC each had their own different hub cab design during this time, however, they both changed styles at the same time. 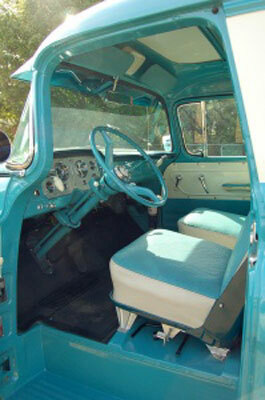 A full Chevrolet or GMC wheel cover was unavailable for the deluxe 1957-59 truck models. GM simply chromed their standard caps that were otherwise painted white. 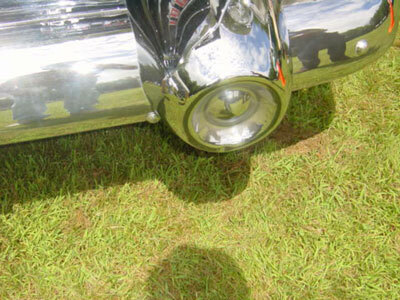 An optional chromed GM wheel ring could be added on the 1/2 ton series in 1957-1959 Chevrolet but not during 1960. 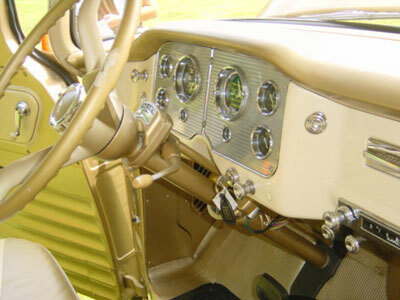 These trim rings were stock on the 1957-1958 Cameo but dealer installed on other 1/2 tons. 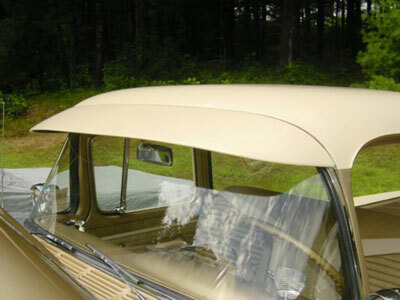 In 1960, a full wheel cover was introduced on the Deluxe 1/2 Ton Package. 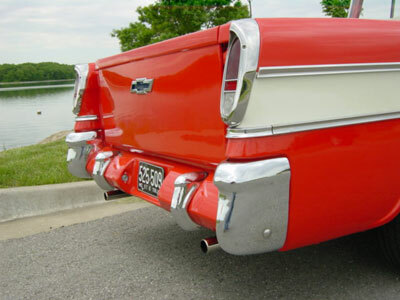 Actually, it was from a 1956 Chevrolet Belair car and 1956 Chevrolet Cameo. Once again, GM used this stamping from five year old tooling and saved production costs. 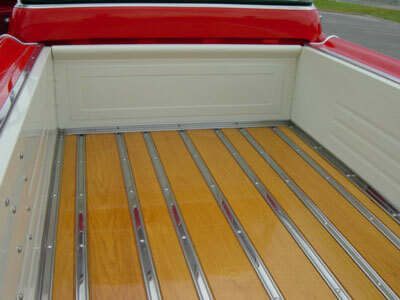 Stainless Steel on the Deluxe 1/2 Ton Pickup. 15″ Wheels only. Chromed steel wheel rings that blend with optional chrome hub caps to give appearance of full-chrome wheels. 15″ wheels only. 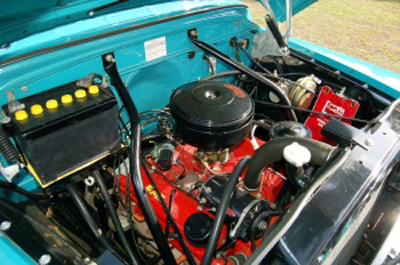 During the mid-1950’s most car and truck manufacturers begin to install optional V-8 engines in their vehicles. 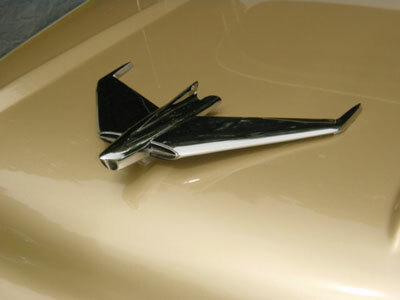 To set the vehicles apart from their six cylinders, V-8 emblems were designed. 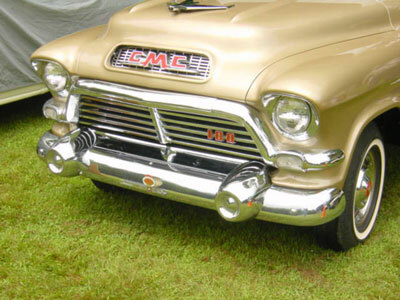 This GMC front fender V-8 emblem was used during 1955 through 1957. 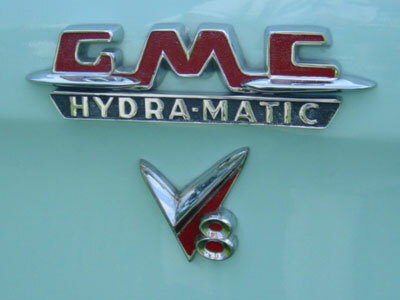 The GMC letters were on both six and V-8 trucks. 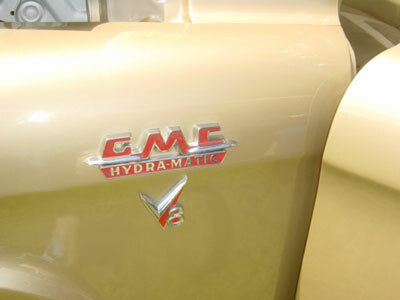 The pictured Hydramatic emblem is removable and would not be in place on a truck with a 3 or 4 speed manual transmission. If you ever wondered about the color of the primer used by GM before the initial paint, these photos give the answer. 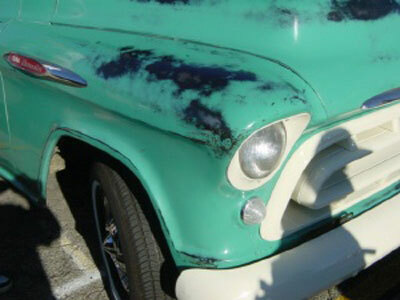 This 1957 Chevy 1/2 ton had been polished through the paint in most areas. 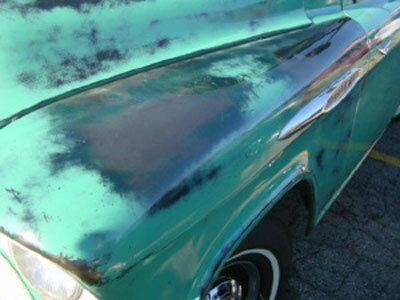 Of course, our question is: Why didn’t they stop polishing when the primer first appeared. Regular readers of this section know we tend to give credit to trucks that are the more unusual. This month is no exception. 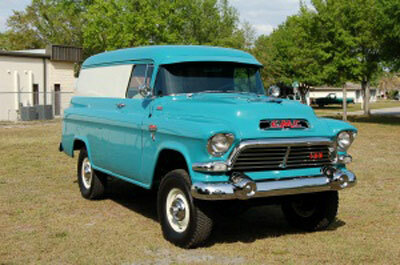 Our truck of the month is a 1957 GMC 1/2 ton NAPCO Panel. 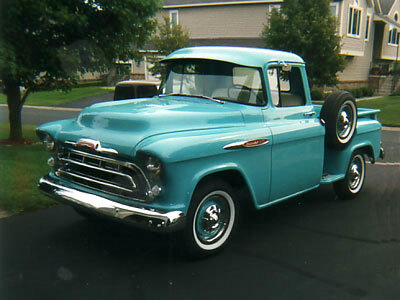 No doubt this type truck was rarely seen even in 1957. When you consider the factory options, it may have been almost one of a kind 52 years ago! Why was this panel truck ordered with so many extras? The owner either had very special needs or the GMC dealer wanted the best for display in their showroom. Money must not have been a consideration. 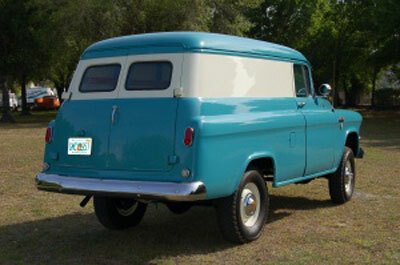 This 1957 Panel truck has its third owner – Ralph Wescott of Largo, Florida. Its working days (may have never existed) are now over. 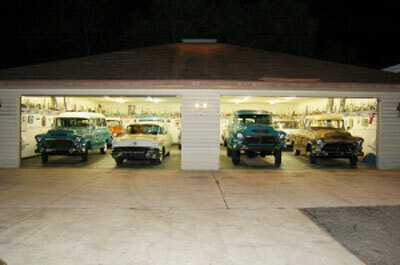 It is kept in Ralph’s temperature controlled garage with several other classics. In viewing this vehicle you will see the same options that are on the dealer invoice including a 347 Pontiac V-8, 4 speed Hydramatic transmission, power steering, electric windshield wipers, radio, turn signals, passenger seat, white wall tires, fresh-air heater, chrome grill and bumpers, clock, chrome dash knobs, two-tone paint, higher speed 3.07 differential, etc. 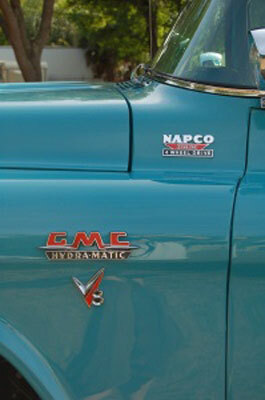 The Denver, Colorado GMC dealership then had a local NAPCO dealer add the 4X4 system. Thus, the total package with freight and handling was over $4,000. Quite a heavy price when you consider a base 1/2 ton was less than $1,500. You couldn’t carry $5.00 in groceries in 1957! 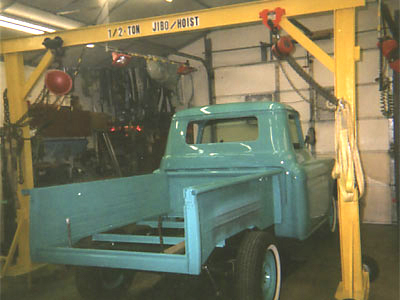 This panel truck was restored ground-up by the second owner, in Michigan, 15 years ago. He then placed it in storage as he did not like the feeling of the hard transmission shift. When Ralph bought it last year, the shifting problem was on the top of his list. It was carefully adjusted step by step with much detail. The Hydramatic now operates like new. 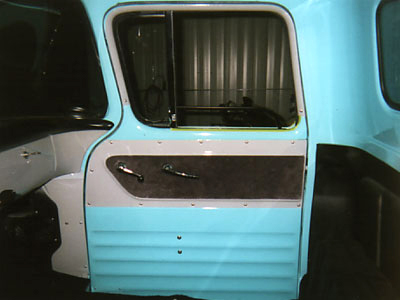 Note the 2 tone on the 1955-58 GM panel trucks consist of the white section by the door windows. This was to give local sign painters more success on adding a customer’s logo. The attached photos show what a special panel Ralph has purchased. The original colors and loaded with options! Note: The new battery caps. Ralph found the 1950’s screw style so he redesigned the battery to fit them. 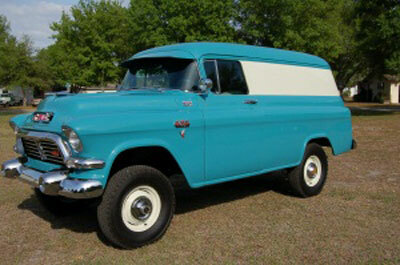 This months feature truck is one of the better examples of a correct 1957 Chevrolet Cameo. 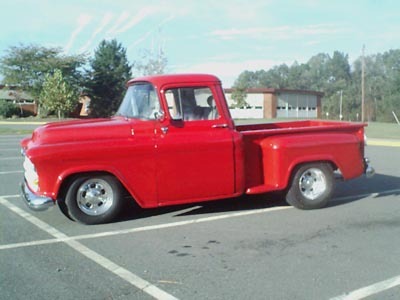 Its a limited production 1/2 ton that was sold four years in the 1950’s. They are now rarely seen. 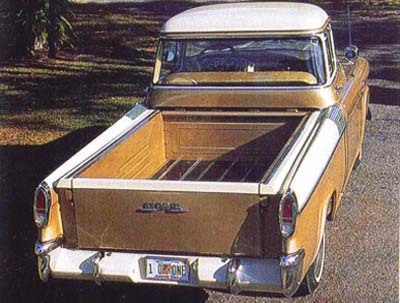 GM added many extras to their 1/2 ton pickup and came up with this very deluxe truck. 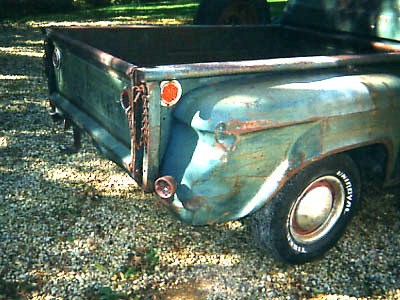 This “Boulevard Truck” drew customers into dealer showrooms and yet could be used by a new owner for light hauling. This Cameo is owned and restored by Ken McCarty of Lake Lotawana, Missouri. It was discovered about nine years ago through a friend of a friend that knew what was under a car cover in a distant neighborhood. It had been beside a house 30 years in storage and was not easily seen by people passing by. Ken must have talked to the owner just right to make the purchase. It was almost as if it was meant that Ken was to own this Cameo. 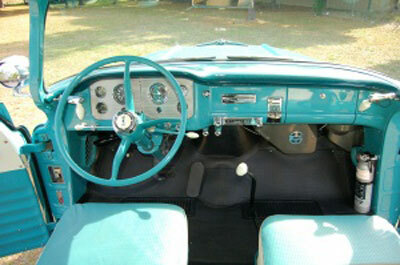 The vehicle was restored piece by piece during five years. The longer restoration time was because Ken developed an illness during that period and his medical recovery took much time. He is sure this Cameo restoration is responsible for him being alive today. Planning on the next steps of rebuilding kept his mind occupied while he waited to regain his strength. This Cameo is just about the way it came from the factory. 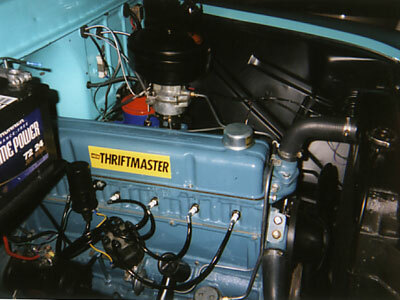 Ken removed a later V-8 and added a more original early 283 cubic inch engine. Its optional overdrive column shift transmission saves engine RPM’s and gasoline plus allows more highway speed. Even a generator keeps the battery charged! The frame and ID plate numbers match. 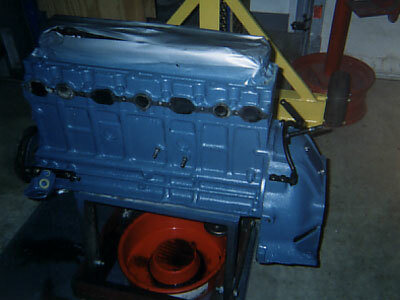 The original painted valve covers and oil bath air cleaner are in storage when he wants to add an original touch. The Cardinal Red and Bombay Ivory exterior paint is just as it would have come from the factory. Note the optional white wall tires. The width of the white is pure 1957 vintage. Ken’s Cameo is now a new truck! It is seen regularly at local car shows and always stops traffic. You can contact Ken McCarty at 1-816-578-4032. You can’t get more unusual than 1 of 1. 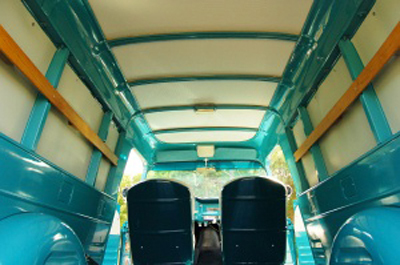 This is how Ralph Wescott of Largo, FL describes his 1957 GMC Palomino. General Motors built only one! 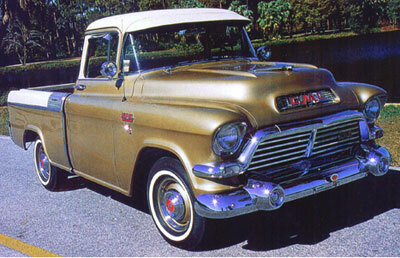 It was produced to draw attention to their truck display at the New York Autorama show in 1957. Fortunately, its prior four documented owners recognized it as special. It has been mostly in storage and only a few recent car shows have had it on display. 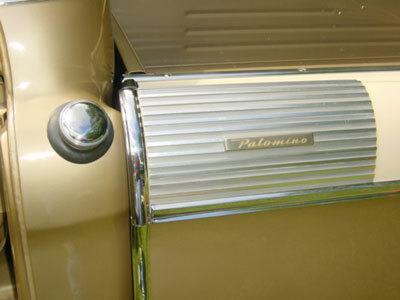 The Palomino now has 9,350 miles and almost no restoration has been done. Even the original custom leather seat is free of age cracks. The engine sounds like new as it slowly moves out of its enclosed trailer. It occasionally may be driven in the neighborhood or at a car show. Gm designed this special 1/2 ton around a fully optional assembly line model. This includes a deluxe cab, Pontiac V-8, Hydramatic transmission, power steering, power brakes, radio, deluxe heater, Cameo style bed, windshield washers, etc. 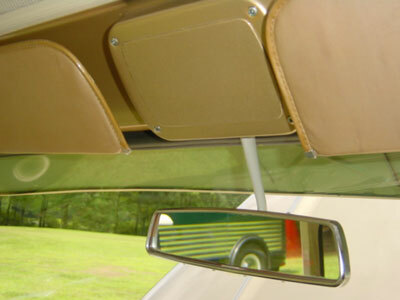 The manufacturer then added additional features that set it apart from the others. 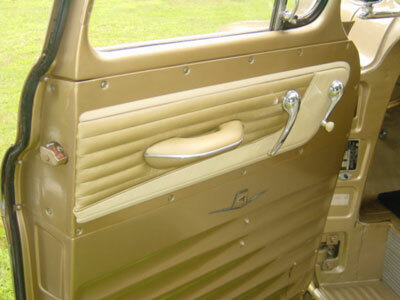 In the following photos note items such as (Palomino only) gold paint, custom leather seat and door panels, script trim panels over the front edge of the bed and gold floor mat. One of its more unique items are the U.S. Royal Master tires. Ralph states GM requested U.S. Royal to produce 5 with this unusual rubber sidewall. After 50 years they are still in on their original 15′ rims! 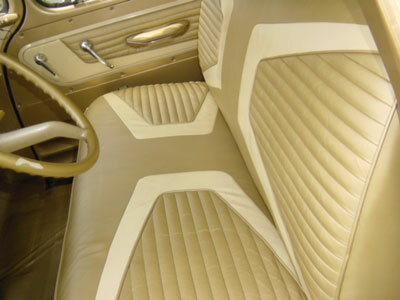 When not at a show the Palomino is in temperature controlled storage out of the sun to protect the leather interior, it’s original paint and bed. 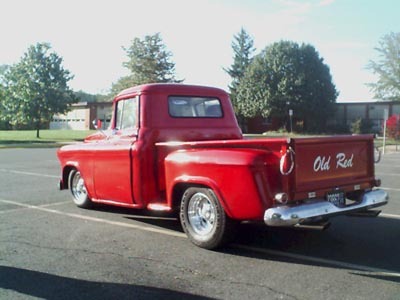 Ralph at 75years old finally decided to sell some of his most prized low mileage show trucks at his own auction that was nationally advertised. The Palomino was given a value by the last bidder. It brought $197,000.00 by a west coast buyer. WOW! See what happens when you have the only one GM ever made. 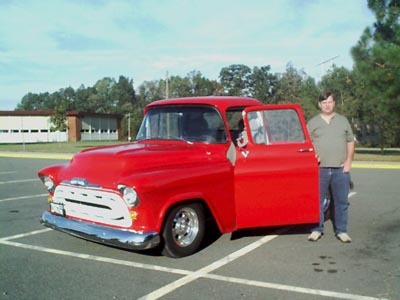 I got this 1957 Chevrolet truck two years a go. It was in bad shape I did a body off restoration. It has a 350 with 700 R4 , S 10 rear and Fat Man front end. With a lot of help from Jim Carter’s I able to do all the work.